I have gone over the concept designs for all of the rooms on the main floor of our house so now it is time to move upstairs. I thought we would start with the master bedroom. Today instead of doing the first concept design I wanted to go over the inspiration for the room. 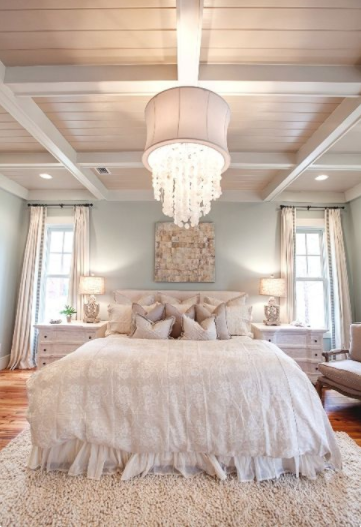 When thinking of a color scheme for the master bedroom I wanted to keep it neutral. Something that both Erik and I would like. 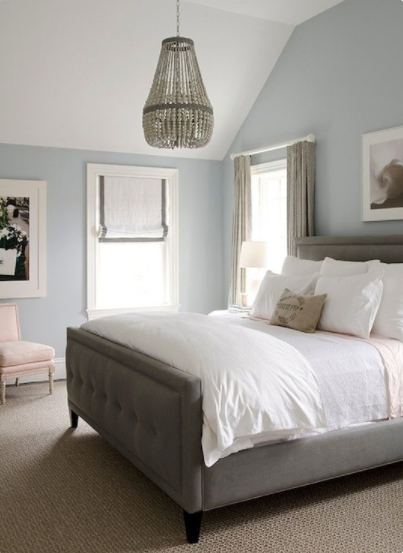 Gray has been Erik's favorite color for years so we went with a gray duvet when we first got married. Now that we are in our own house we have been trying to decide what other colors we can add in. We decided on blue and purple. Instead of the dark blue that you have found in the other rooms of our house we are going with a light blue. 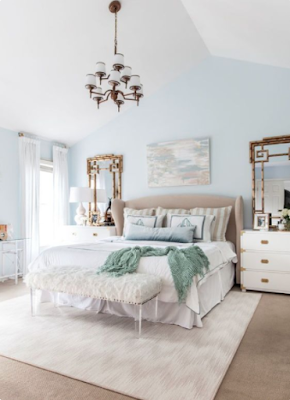 I found these images on Pinterest of master bedrooms with light blue walls and loved the way they looked. All of the rooms feel so clean and open. And as you might have noticed most of them have the color gray included as well. Since the light blue and gray are so calm together we wanted to add in a pop of color. I thought purple would be a nice touch and since Erik also likes the color he didn't have a problem with it. There will be pops of deep purple around the room to add in color. I like that it adds a bit of a darker aspect and romantic feel to the room. We will show you all of our plans with our next few concept designs. What are the colors in your bedroom?